News has been buzzing in The Netherlands today that Dutch King Willem-Alexander has purchased a new yacht, an 11.3-metre Wajer Osprey 38 superyacht tender from Wajer & Wajer Yachts. The Dutch yacht builder Wajer & Wajer introduced its stylish superyacht tender in 2013 as its new flagship, replacing its 37 Osprey model. 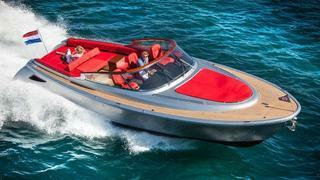 The superyacht tender is also designed by a Dutch company, Vripack Naval Architects. While Vripack and Wajer & Wajer couldn't officially confirm the order, they did speak with Boat International about the news that a King was seen cruising aboard one of their designs. 'I'm very honoured,' says Marnix Hoekstra of Vripack. 'Every client perfect if they can appreciate what you design, but a client of this pedigree obviously makes you very proud. Clearly there is a lot to choose from. Hoekstra says Vripack's brief for the Wajer Osprey 38 was to design the ultimate day boat, with the potential to rival Riva. As Hoekstra pointed out, Rivas are well known for ferrying celebrities and royalty along the Côte d'Azur, and now Wajer & Wajer will carry royalty as well. The GRP-built modern-classic day boat has an exaggerated sheer line and classic styling cues complemented by a modern paint job. As the yachts are customisable, this can be unicolour or metallic, as pictured above. The Dutch King's Wajer & Wajer has been customised with a silver metallic hull and, of course, orange upholstery showing off Dutch pride. The interior is also customised with a carbon fibre finish rather than the standard mahogany. Under the water is where the modern design really comes into play. The Wajer Osprey 38 is powered by brawny twin 435hp Volvo D6-DP six-cylinder diesels married to IPS600 dual pod propulsion allowing for easy joystick control. Designed for performance, she can top out at speeds of 45 knots. King Willem-Alexander is said to have purchased the yacht to use in Greece where his family has a holiday home. The base price of a Wajer Osprey 38 €625,000 Vat excluded, and €730,000 fully specced out with the top engine package and carbon fibre finishes.